I'm not superwoman. I'm not superwoman. I'm not superwoman. Well, I was gently reminded by my good friend Mandy the other day, that I'm not. Everywhere I turn, I see "New Year, New You!!" and all the while it's giving me a freaking complex already. I am an admitted over-achiever perfectionist and well, the OLD me is screaming at myself for trying to be so new and awesome be the best wife, publisher, blogger, photographer, consultant, mother, cook, maid, yadda yaddda......and well I MIGHT have had a mini meltdown the other day. Might. "Stop trying to be superwoman," those were Mandy's words, and damn it...she's right. Just keeping it real. Why is it so easy for the "perfection infection" to take control and help us lose all sense of reality, which is 1000% IMperfect? Why? I don't know, I just know that I'm so thankful for friends that keep it real and slap me back to normal once in a while. 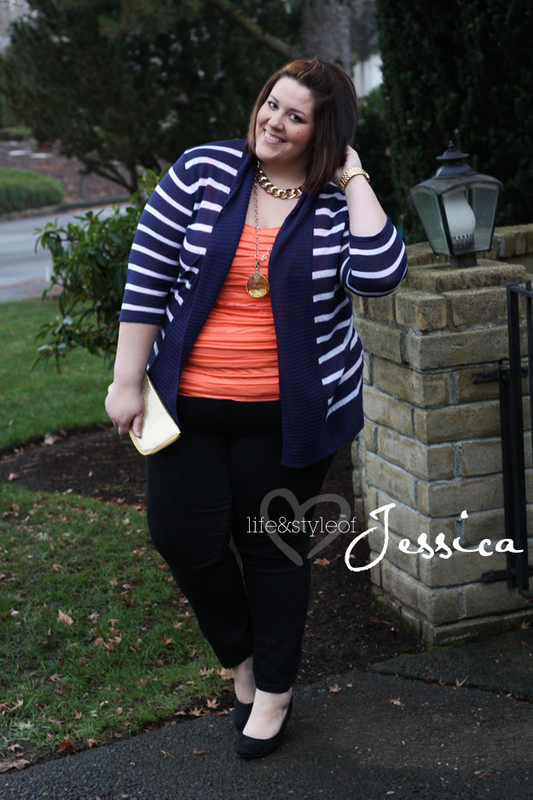 Oh, and I'm VERY thankful for my Torrid navy blue striped cardi, it makes me feel normal too. LOL In fact, after looking at these pictures again, my new favorite thing in my closet.